For the second time in less than a week, a nor’easter is tearing up the East Coast. The last one blasted New England with gusts up to 97 mph and knocked out power to 2 million homes and businesses. This one will dump more than a foot of snow from Philadelphia to Boston. By the time this storm is over late Thursday morning, New York City will be under 8 to 12 inches — but the heaviest snow will fall in New Jersey and parts of Upstate New York. As much as 24 inches is possible in those areas. 11:04 a.m. — It’s still snowing! Snow ended for the Tri-State area late Wednesday night, but it’s still snowing from Eastern Massachusetts north through New England. Snowfall rates peaked at a whopping 6 inches per hour last night in Vermont. Maine is getting the heaviest snow on Thursday morning, although a few significant bands are trickling down into Massachusetts. Only a couple more inches will fall there, but parts of Maine will get over a foot on top of what has already been measured. A quick look at snowfall totals seems to suggest the forecast was pretty good. The only place it didn’t do well was New York City, where temperatures were just too warm for the storm to overcome. It started snowing there late Wednesday morning, but didn’t really begin to accumulate until early evening when the sun went down. Temperatures near the ground (and the ground temperatures themselves) were too warm for accumulation. This is fairly typical, though — the urban heat island effect almost always reduces the amount of snow a big metropolitan area like D.C., Philadelphia and New York will get. The hard part is knowing how much of that warmth to take into account in the snow forecast. For better or worse, meteorologists tend to play it safe and forecast snow on the high end so people are prepared. That’s impressive by any standard — even Vermont’s. The Berkshires are getting slammed multiple feet of snow tonight, and it’s not the heavy wet kind that fell along the I-95 corridor. The air is much colder there, which means all of the precipitation will fall as light, fluffy snow. That also means snow depth will be much deeper because it’s less compact. This was the scene earlier in the evening as reported by NBC Boston. Several inches of snow has accumulated on the roads in Massachusetts and they are treacherous. This looked like it was going to be a slow-motion tragedy up until the last second. And in Hamden, Conn., we see what it looks like when a transformer blows right in front of your house. This usually happens when power is cut off in one area, causing too much electricity to flow through other transformers. When this happens close to home, power will usually be out for a while until the entire transformer can be replaced. Once the sun went down, temperatures dropped and snow started to stick in New York City. Accumulation there so far is roughly 3 to 6 inches. To the west, snow totals have met or are approaching 24 inches in Bergen, Essex and Passaic counties. Areas farther inland were expected to get more snow — it’s colder there because it’s farther away from the water and the elevation is higher. Rain also changed over to snow from eastern Connecticut to Boston. Thunder and lightning are still cracking along the rain-snow line (rain to the east, snow to the west), and was captured marvelously by this kind stranger who shared the video with Weather Nation. The forecast looks like it will have been pretty good in the Philadelphia area and New Jersey. That region got hit with what will probably be the most intense snow band of this storm as it rapidly intensified just off the coast. Visibility fell to a few hundred feet and snowfall rates exceeded 2 inches per hour. Philadelphia was forecast to get 6 to 8 inches, and what fell was easily in that range, although some areas may have gotten a little more. 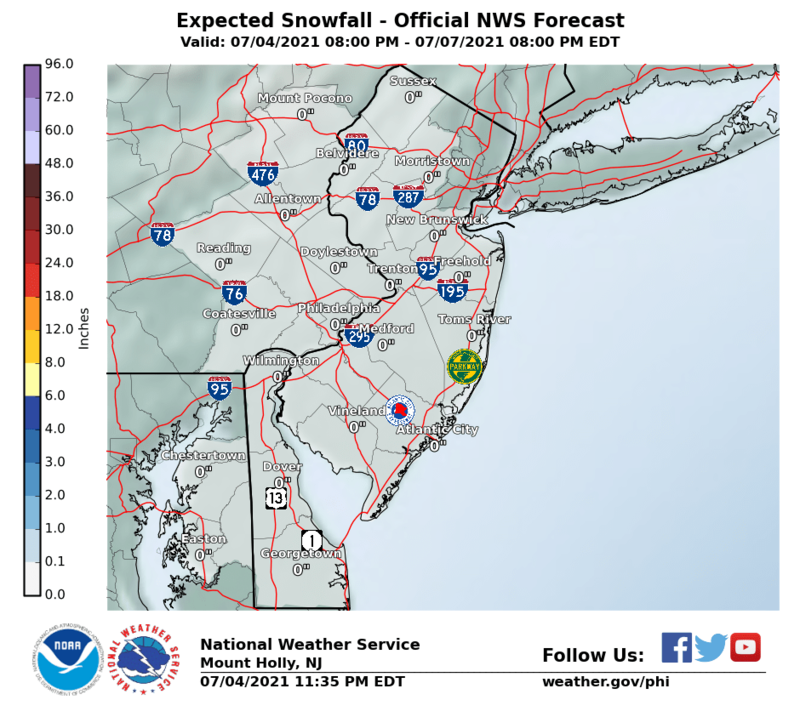 In Trenton and points north, the forecast was more like 8 to 12 inches and it looks like that was also broadly correct, though we’ve seen some reports that exceed 12 inches. The heaviest snow has yet to fall in the immediate New York City metro area. Temperatures will drop as the sun goes down and places that haven’t seen much accumulation yet (we’re looking at you, Manhattan) will start to see snow coat the ground this evening. 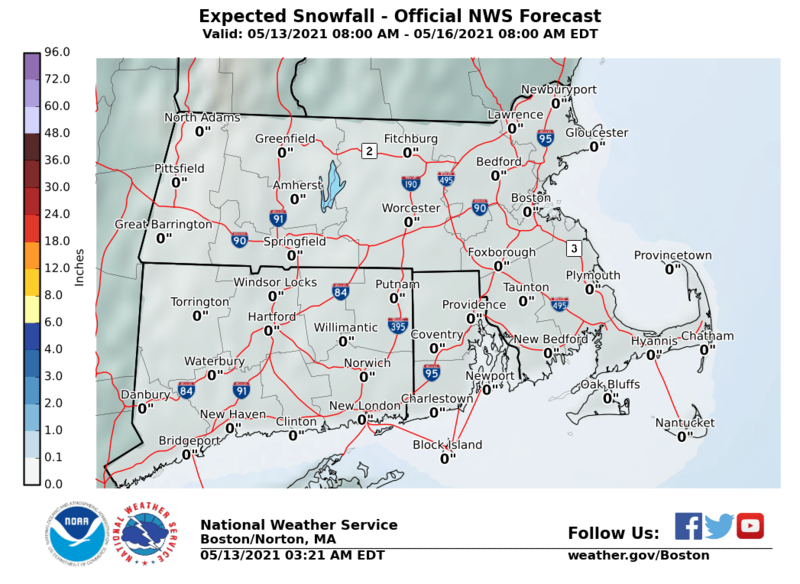 Farther north in Boston, rain will change to snow around and after 8 p.m., though it’s been snowing at a good clip in western Connecticut and Massachusetts, where totals thus far range from about 3 to 6 inches. Here’s what the clouds looked like this afternoon, seen in high-res from NOAA’s GOES-16 satellite. Heavy wet snow is falling in Staten Island now, while just across the river there’s barely a trace on the ground. It’s warmer in Manhattan than all of the surrounding area — Midtown’s temperature is around 35 degrees. Snow is falling but it’s melting on contact. The storm will ramp up in New York City before it ends, and temperatures are dropping as the sun goes down. More accumulation will build up through the evening. This video came from Sourland Mountain in New Jersey, which is west of New Brunswick and north of Princeton. It’s on the north end of the snow band we were talking about in the previous update. More than 6 inches of snow is on the ground in Princeton, according to local reports. Sourland Mountain looks like it’s at least approaching 12 inches. As the storm intensifies offshore, it’s dumping snow on New Jersey. This snow band shown on radar below is exceptional. From Princeton to Ocean City, snowfall rates have surely topped 2 inches per hour. On the right is a precipitation type view that tells us it’s all falling as snow. On the left is the actual intensity — the more red it is, the more intense the snow is. Those values in the orange and red (up to 60 dbz, for the weather nerds following along) are something we usually see in summertime thunderstorms, not snow. Visibility within this snow band is down to a few hundred feet. Driving in this kind of snow is extremely dangerous. It’s not like a hurricane eye, but this dry slot does signal that this storm is rapidly intensifying. This is a classic nor’easter with a comma-like shape, which is why you’ll sometimes hear meteorologists refer to the comma head — the part of the storm at the top where the heaviest precipitation is located. This afternoon, the comma head is over New Jersey and the Tri-State area. Temperatures have so far been just above freezing in this region, but we’re seeing them steadily fall. The heavy snow is cooling the air and its allowing more snow to accumulate on the ground. 2:35 p.m. — This storm is a pain. It’s also quite beautiful. Thanks to Philly.com’s Michael Boren for sharing his videos with us this afternoon. As much as 7 inches of snow had been reported in the Philadelphia area through 1 p.m.
And they’re pretty impressive for a storm that only really got started a few hours ago. Areas to the east of I-95 have the lowest accumulation so far because temperatures stayed relatively warm into the late morning. A lot of the snow that fell early in the storm melted on contact, too. We’re seeing more accumulation now that the snow has brought ground temperatures down. Are we missing a snow report you think we should include? Tell us in the comments. As forecast, the snow is accumulating rapidly this afternoon. In the Trenton area, 1.5 inches accumulated in 40 minutes, according to a trained weather spotter. In just the past few hours, the accumulation on the ground has reached 6 inches in the N.Y.C. area. If you’ve taken a recent snow measurement, let us know in the comments. Check out the radar. The heaviest snow is falling from Philadelphia to New York City. Thunder is cracking up and down the I-95 corridor. There are some incredible dynamics at play here, but suffice to say this storm is ripping and it will continue through the afternoon. Roads have become treacherous and visibility is low. I’ll be back soon with some snowfall totals thus far. From Philadelphia to New York City, heavy wet snow is coming down in buckets. It’s sticking to the streets in Philly and just starting to accumulate in New York City and its suburbs. Roads may become impassible very quickly. This is what the scene looked like just north of Philadelphia at 12:50 p.m.
That didn’t take long. Thunder and lightning are dialing up over New York City. Reports have come in from Lower Manhattan and Brooklyn. Snow may not be sticking to the ground in the boroughs yet, but it’s about to get very heavy and accumulation will be rapid once the ground temperature gets colder. Giant snowflakes are falling in Philadelphia, where the forecast is 6 to 8 inches. Michael Boren, a reporter at Philly.com, shared this photo with us from the newsroom downtown. Now that precipitation has changed over to all snow, it will accumulate quickly in a short amount of time. Snow looks like it will last through the evening in Philadelphia, tapering off by around 9 p.m. Warm air is spiraling into the developing storm from the southeast, swirling in the all the way from the Gulf of Mexico. This air will ride up over the chilly air on the backside of the storm, climbing high into the sky in a region called the “comma head.” This is where heavy snow wraps in on the west side of the storm — the overlap of cold air, moist flow at the mid-levels, and dynamic lift in the atmosphere. The combination of these three features will lead to prolific snowfall rates from northern New Jersey and New York City, as well as in western Connecticut and central Massachusetts. Anyone along Interstate 95 in the Northeast away from the immediate coastline is in play for a four-hour period of two to three inches per hour snowfall rates. Of course there is lightning involved, which means thundersnow is just as dangerous as thunderstorms. It might be raining right now in parts of the Tri-State, but this thing is just getting started. Based on the position of the storm and how things have played out so far, the National Weather Service increased the snow forecast for the region (again). They’re now calling for 8 to 12 inches of snow as far east as Suffolk County. Their forecast of 12 to 18 inches is creeping precariously close to Manhattan, and already includes the Bronx, Hudson, Bergen and points north and west. Forecast as of 11 a.m.
We’re watching temperatures closely because once they fall below freezing, all of the precipitation will come down as snow. At 11 a.m., parts of the Tri-State area were still seeing a lot of rain. That will change through the afternoon as temperatures drop. By 3 or 4 p.m., rain will change over to heavy snow for virtually all of New Jersey, the entire New York City metro area and Long Island. 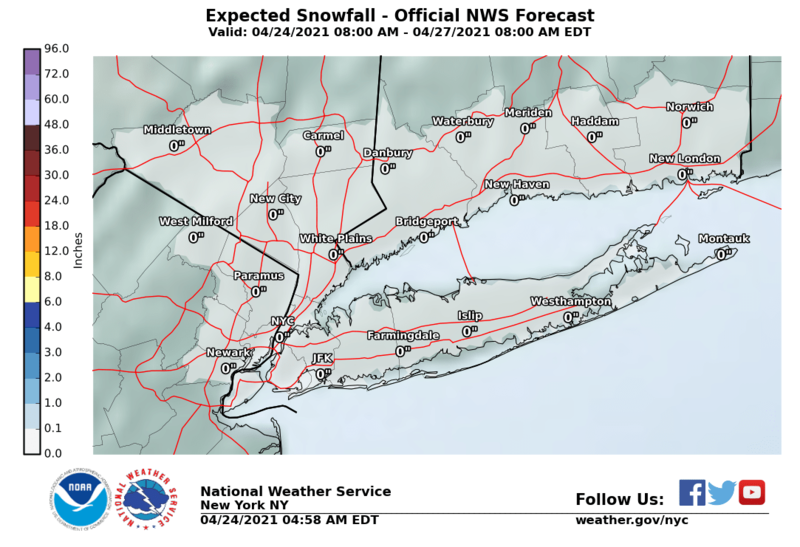 The Tri-State area woke up to higher snow forecasts Wednesday morning. The storm shifted slightly southeast — just 20 to 40 miles, but every mile matters in nor’easters. Because of the shift, temperatures will be colder in the Tri-State and thus more of the precipitation will fall as snow. The National Weather Service also noted that if the storm continues to shift southeast, they might have to increase the forecast snow totals even more.